As a parent of a tween, I can tell you that they’re not always easy to buy for. Certain toys or games are deemed too “babyish”, while others are too mature (or at least for my taste!). Thankfully, I can always rely on books from National Geographic Kids to provide countless hours of entertainment for the hard-to-buy for 8-12 year old. National Geographic Kids teaches kids about the world and how it works, empowering them to succeed and make it a better place. It is the only kids brand with a scientific, education, and conservation organization at its core. The second annual Almanac Newsmaker Challenge invites kids create a time capsule for kids in 2050 that shows what life is like today. Just gather up to 10 “artifacts,” photograph it, and share it on My Shot, the Nat Geo Kids online photo community. Get the details at: natgeokids.com/almanac. 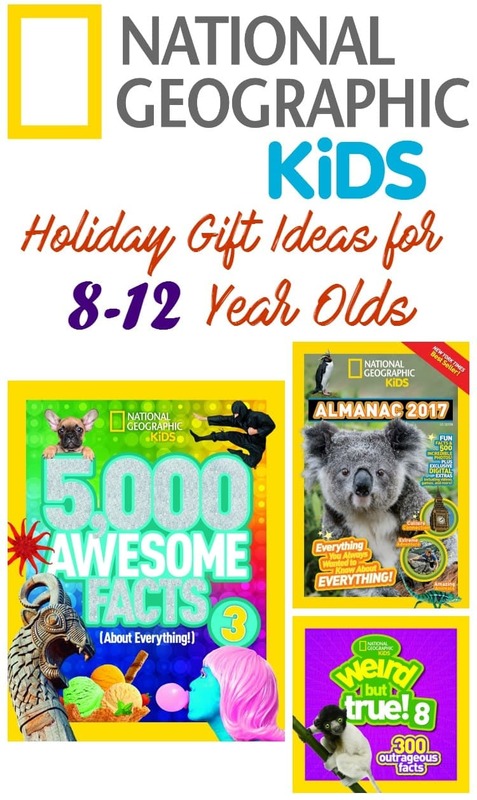 I gifted my daughter these books (thanks to National Geographic!) and she absolutely loved them! She poured over the 5,000 Awesome Facts book for days, making sure she updated me with random facts the entire time—Did you know more than 1 billion people in the world live in deserts!? National Geographic Kids is the #1 publisher of nonfiction books for kids, producing more than 100 titles per year. From board books to leveled readers to almanacs to the wildly popular Weird but True series, there are books for every young reader on your list. Any of the Weird But True books I know my son would love. My son would like Weird But True. Mine would like the “weird but true, gross”. The kids would love the book 5,000 awesome facts. My son would like the 5000 Awesome Facts book best. 5,000 awesome facts about everything! My kids would love the 5000 Awesome Facts book! They would love the Weird but True book. My son would probably love the weird but true gross facts! my son would love weird but true, gross”. My son would like the Weird but True book. My son would like the 5000 Awesome Facts. My boy would like any of the awesome facts books. My grandson would love the 5000 Awesome Facts book. He would love any one of the great books though. My daughter would love the weird but true book! our son would love the 5000 awesome facts book. he is really into that kind of book. My grandson would like the Laugh & Learn Kid’s Jokes book. He likes to laugh! My son would love the 5,000 Awesome Facts book. I think they would love the 5000 facts. My daughters would love the 5,000 awesome facts book! My sons would love the Weird But True! books! 5000 Awesome Facts – thanks for the contest!